This is part 5 of a six-part series of guest posts by Tomer Perry, Research Associate at the Edmond J. Safra Center for Ethics, Harvard University. He can be contacted at tperry [at] ethics [dot] harvard [dot] edu. This post is dedicated to what could be the most important game mechanic: decision-making. One of the main challenges in teaching ethics is connecting moral theories to the kinds of decisions that students are likely to face once they graduate. The issue is not merely pedagogical but also substantial: it’s not always clear, or a matter of consensus, what a given theory would instruct us to do in a specific context. Some theorists think that ethical decision-making is not at all a matter of applying the right theory in the right way but a matter of exercising judgement or exhibiting virtue – you can’t know the right thing to do until you’re actually in the situation to make a decision. Caverna: a family of dwarves specializing in growing wheat and sheep. If you’re struggling with these issues, game design can help because games are all about making interesting decisions. Games are basically structures for play and what they structure is usually decision-making; the restrictions posed by well-designed games don’t stand in the way of meaningful decision-making but instead facilitate it. You may be inclined to ask your students a lot of open-ended questions, but if the goal of a class is to force students to confront a difficult trade-off in moral values, you are better off with a restricted set of options. This is exactly why so many philosophers construct bizarre and unrealistic thought-experiments to make their arguments, and it is also why students often try to substitute an easier question for the one that forces the difficult trade-off. Game designers recommend thinking about the choice points you give your students. Instead of leaving it up to students to choose whether to exercise moral judgement, create situations that force it. Restrictions are often not particularly fun and they can be stifling, which is why games should have multiple paths to victory. The idea here is that you want to create a structure that allows for at least some variation and creativity – it shouldn’t be so restrictive that it forces all students to make the same decisions. For students to have a meaningful choice, they should either be allowed to pursue different goals (‘I want to win the elections at all costs!’ vs. ‘I want to do the right thing’) or have different ways of getting there. 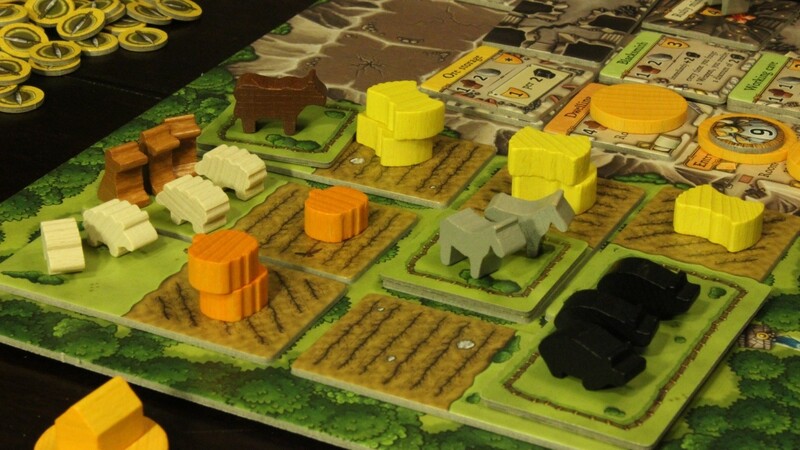 For example, in the board game Caverna, players control families of farming dwarves and compete against each other to create the most efficient cave-farm. Though the game restricts all choices to the particular world of cave-dwelling dwarf farmers, it allows players to choose their path: Do you want to specialize in pig farming? Or perhaps you’d rather dig for rubies in the depths and pursue agriculture only to sustain your extensive family of dwarf diggers? The game offers multiple viable alternatives for achieving victory. Lastly, game designers recommend tying decision-making to measurable outcomes. Some instructors use grade bonuses as motivators but I find that in the context of a game, or a simulation, it’s often enough to give students ‘points’ and declare a winner. My campaign simulation gives students who employ morally questionable tactics the opportunity to gain more in the polls and the group with the highest poll numbers at the end of the simulation is declared the ‘winner’ of the elections. It is only after the exercise, in the debriefing, that I ask my students to reflect on their own decision-making and ask if it was worth winning an election by lying or logrolling or would they rather lose than using certain methods. The key point is that students understand pretty quickly, during the simulation, that their choices matter; if they don’t engage in questionable tactics and others do, they might fall behind. 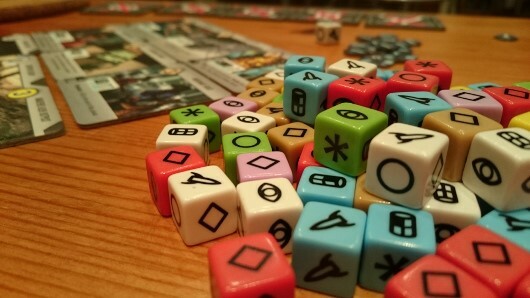 Roll for the Galaxy: a game with colorful exciting dice and many ways to manage risk. The last piece of advice from game designers about making decisions meaningful is to take the results out of your own hands. Use a randomizing device, like dice, to determine consequences. Deploying chance is a great tool for exploring how uncertainty affects decision-making. In addition, rolling dice is exciting and fun; students will cheer when they get the result they want, even if later they have to confront the fact that they took a huge risk. Game designers have a lot of ideas to offer on the management of randomization – how to avoid excessive ‘luck’ and control risk. If you’re interested in that, put your questions below and we can discuss it in the comments. < Previous Confidence and simulations: a rising tide? I’ll bite: what would be a good way to control for risk and randomization in a simulation for teaching ethics? Is there some advice that goes beyond “don’t use too little or too much randomization”?